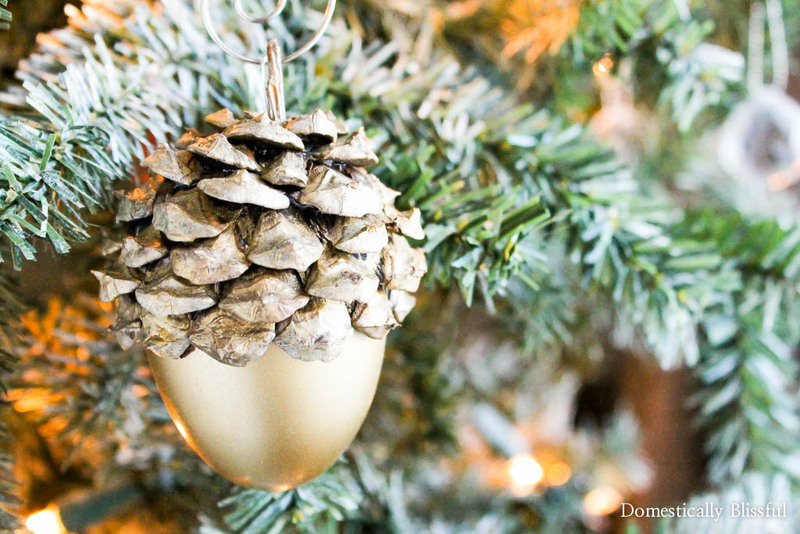 I must admit, I cheated a little on these Faux Acorn Christmas Ornaments. 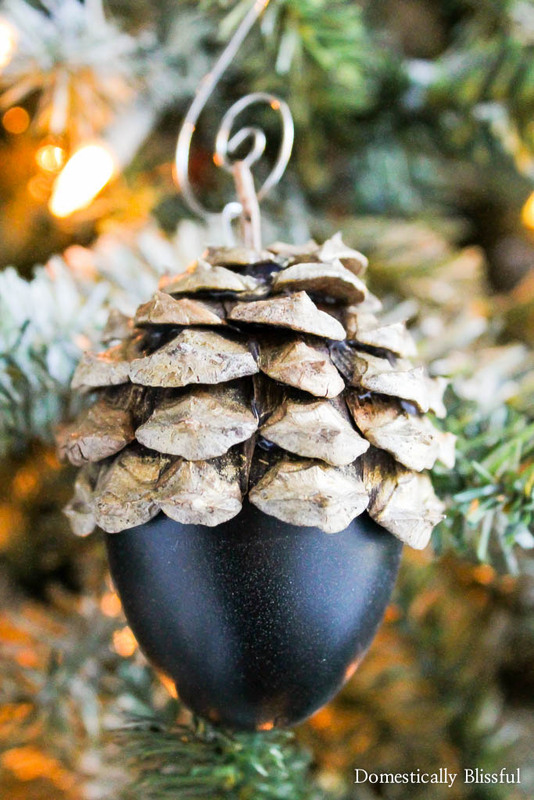 I really wanted to create artificial acorns for my Christmas tree, but I didn’t have any more Easter eggs leftover from my DIY Fall Acorns, so I decided to simply turn a few of those into Christmas ornaments. 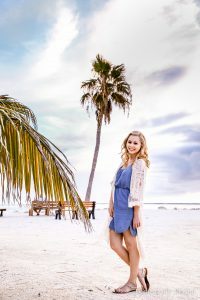 Minimal work with the same result! 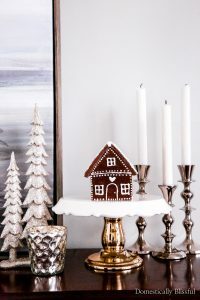 Don’t you love it when you can turn spring decor into fall decor & then turn that into Christmas decor too?! A repurpose project into a repurpose project. Yeah, I’m pretty pleased right now. Oh well! I really like the outcome & am super excited about how it looks on our pretty Douglass Fur Christmas tree! Yes! You read that right! We got our Christmas tree last weekend!! 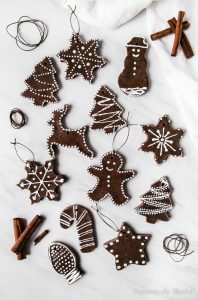 Now I know some might think it’s a little early, but we have good reasons. And if Lowes doesn’t think it’s too soon to be delivering & stocking them, who am I to question them? Saturday night Roger & I began our annual Christmas tree decorating party. We went to Lowes, picked out a beautiful tree, & brought it home. We then watched Elf & decorated the tree with lights. Then Sunday night we drank hot chocolate & decorated our Christmas tree while listening to Christmas music. We even set up a Polar Express Train around the base of our tree! 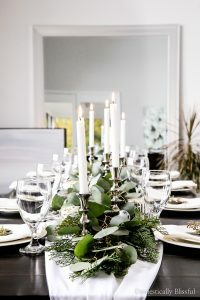 Don’t you love Christmas traditions? 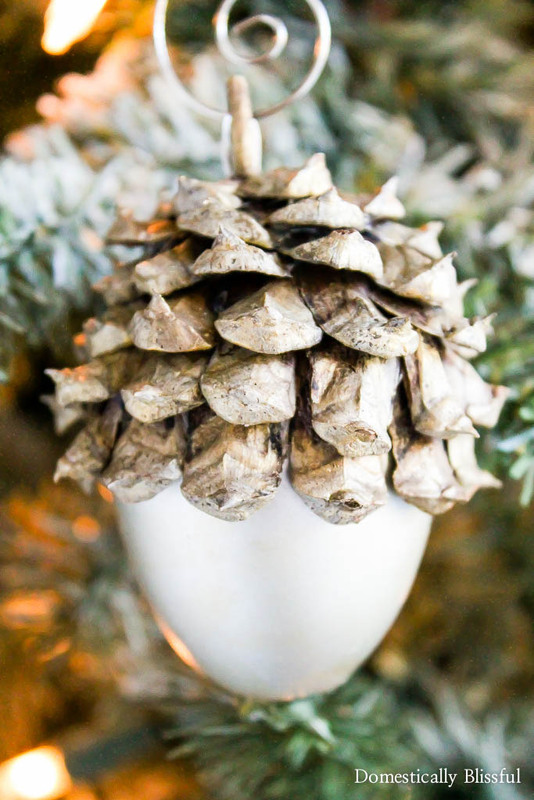 But back to these Faux Acorn Christmas Ornaments! 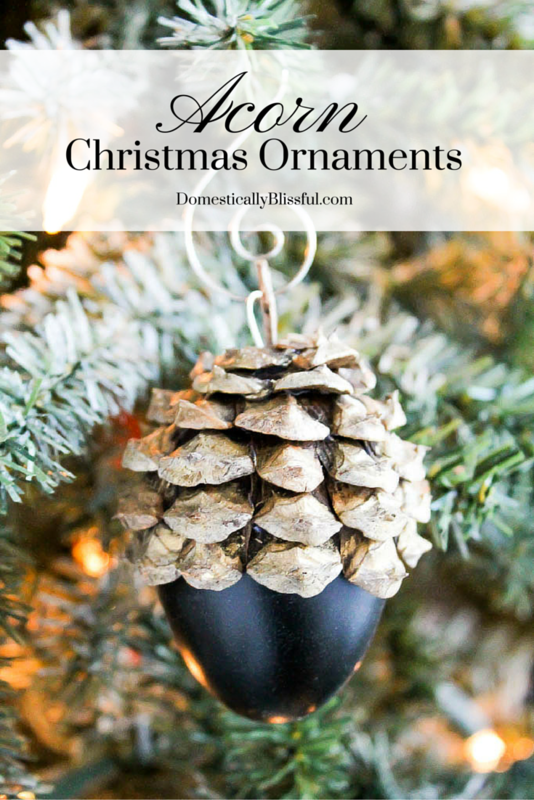 One of my favorite things about these Acorn Christmas Ornaments is that you can customize & personalize them however you like so that you will have one-of-a-kind Christmas Ornaments! I spray painted mine with gold, silver, & chalkboard paint. 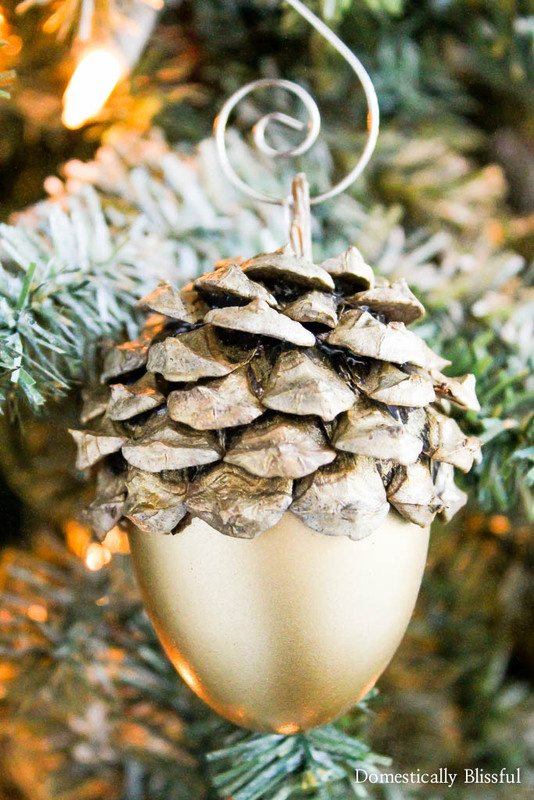 Then I topped them with twine & pinecone pieces, along with an ornament hook & a little twig to act as the stem. But you could spray paint them according to your color scheme or favorite Christmas colors & top them with anything! 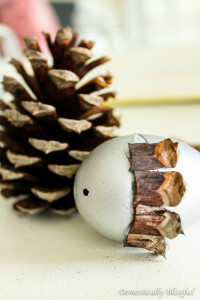 I even have a few Easter egg acorns that I covered in glitter this fall that I might turn into Christmas ornaments too! Oh & the best part, you can even put little gifts into the center of the acorn if you don’t glue the pieces together. Isn’t that fun? First, spray paint your easter eggs. I gave my Easter eggs two coats of white paint first because I wasn’t sure if the color would show through. I then decided to spray paint a few gold, black (with chalkboard paint), & silver. I then added a coat of clear polyurethane to protect the eggs. 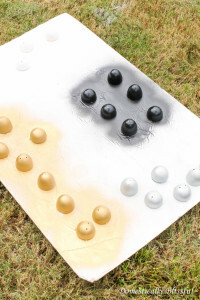 I also dry brushed a light layer of gold paint on the silver eggs to create contrast. Then to top all the acorns off I added twine to a few & pieces of pinecone to the others, along with a twig for the stem & a bent/shortened Christmas ornament hook (The hook is bent & cut the same way I did it for my Sparkling Glitter Ornaments, DIY Doily Christmas Ornament, & Mini Grey Wreath Christmas Ornaments). 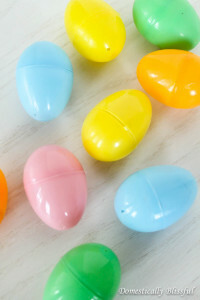 I attached these to the easter egg with a hot glue gun & glue. I also decided to brush the top of the pinecone acorns with a little bit of gold paint. 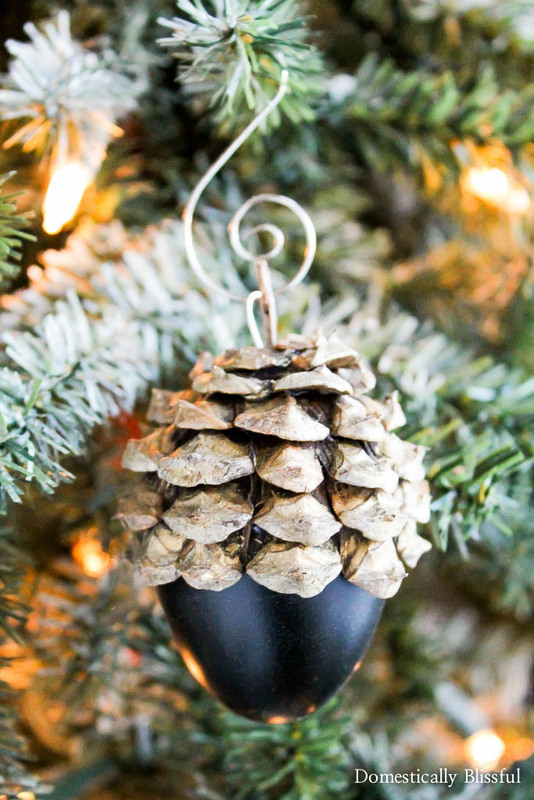 Then simply add a Decorative Ornament Hook & hang your Acorn Christmas Ornaments on your Christmas tree! 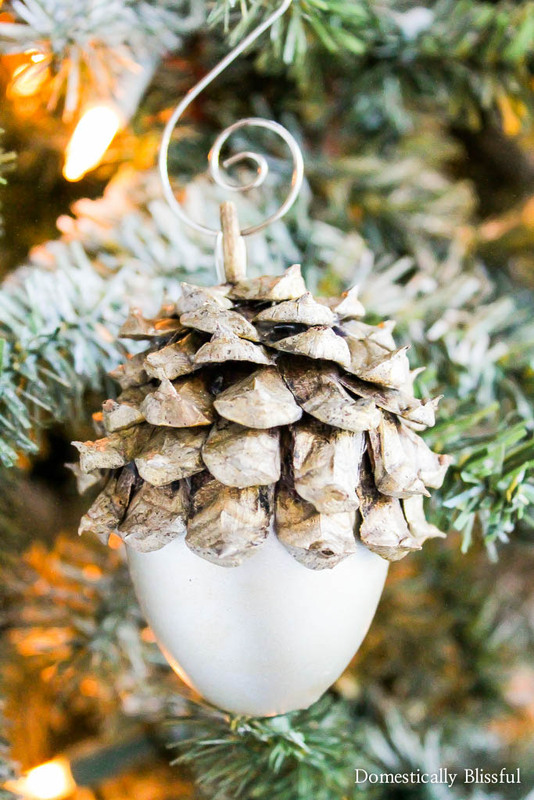 I’d love to see your Faux Acorn Christmas Tree Ornaments!